Table salt or sodium chloride crystals are among the easiest crystals to grow. The materials are easy to find and inexpensive, plus the crystals are non-toxic. First you need to prepare a saturated salt solution. Stir salt into boiling hot water until no more salt will dissolve. Salt may settle out at the bottom of the liquid. This is fine – just make sure none of the undissolved salt gets into your crystal-growing container. Be sure the water is as close to boiling as possible. Hot tap water is not sufficient for making the solution. If you want colored crystals, you can add some food coloring to this solution. If you want crystals quickly, you can soak a piece of cardboard in this supersaturated salt solution. Once it is soggy, place it on a plate or pan and set it in a warm and sunny location to dry out. Numerous small salt crystals will form over the span of a couple of hours. If you want a mass of crystals, you can simply pour the saturated salt solution into a clear container and let it slowly evaporate. Crystals will grow on the sides of the container. If you are trying to form a larger, perfect cubic crystal, you will want to make a seed crystal. One way to get a seed crystal is to pour a small amount of saturated salt solution onto a saucer or watch glass. As the liquid evaporates, crystals will start to form. Select a single square crystal and remove it from the dish. To grow a big crystal from a seed crystal, carefully pour the supersaturated salt solution into a clean container (so no undissolved salt gets in), allow the solution to cool, then hang the seed crystal in the solution from a pencil or knife placed across the top of the container. The solution needs to be saturated and cooled so that it won’t dissolve your seed crystal. You could cover the container with a coffee filter or paper towel to keep out dust, yet permit evaporation. Experiment with different types of table salt. Try iodized salt, uniodized salt, sea salt, or even salt substitutes. Try using different types of water, such as tap water compared with distilled water. See if there is any difference in the appearance of the crystals. If you are trying for the ‘perfect crystal’ use uniodized salt and distilled water. Impurities in either the salt or water can aid dislocation, where new crystals don’t stack perfectly on top of previous crystals. What type of string do you use? I tried to use kitchen string and it didn’t work. A ‘furry’ or absorbent string works well for me, like yarn or a cotton string. Another option is to grow a seed crystal by evaporating the solution in a shallow dish and then tying that crystal to nylon fishing line. The crystals won’t stick to the nylon, so they will grow better on the seed crystal. Can you explain how to tie the seed crystal onto the fishing line? Thank you. You want a fine monofilament line. What I do is place the line on a dark surface (so I can see it), use tweezers to place the crystal, and then I tie a knot around it. For most crystals, I avoid the line altogether and just place the seed in a new container and add fresh solution. There’s less chance of ruining the crystal structure or getting distortion moving forward. Just a suggestion, try adding a small amount of ferrous chloride into your solution during heating. 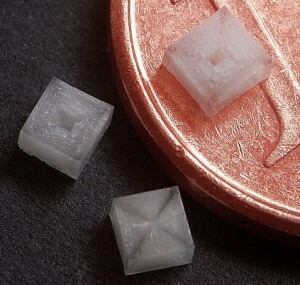 The salt will form larger, clearer crystals in a “quicker” time frame. I say “quicker” because it may still take up to months for a crystal a few millimeters in size.Though they still grow at a faster rate with more clarity from what I’ve seen. Do anti-caking agents in table salt interfere with crystal growth?